No enemies to the right? Anthony Albanese has a piece in the #Ozfail (not linked) restating standard  claims that political life is increasingly characterized by echo chambers and that we ought to make more of an effort to engage with those whose views differ from ours. this polarisation in global politics has seen the demise of many of the historically successful progressive political parties such as France’s Socialist Party, PASOK in Greece, the Partito Democratico in Italy, the Social Democrats in Germany and many other affiliates of the Socialist International. In many countries, parties of the radical Right have emerged with disillusioned working-class people as their social base. What’s striking about this list is that most of the examples lost votes at least as much to parties on their left, which rejected their complicity in austerity: Syriza in Greece, Melenchon’s la France Insoumise, and the Greens in Germany and the Netherlands. Yet there’s no hint in Albanese’s article that the centre-left needs to be open to the views of such groups and their supporters: apparently, we need to be talking to the supporters of Golden Dawn, Le Pen, AfD and so on. Albanese’s position in Australian politics is exactly the same. He’s happy to talk to Andrew Bolt and the Oz in the interests of an open debate, but as far as I know he has never had a good word to say about the Greens, let along sought to open a dialogue with them. Apparently some alternative views are more equal than others. fn1. Although claims that the Interent has produced echo chambers have been made widely, it’s far from obvious that exposure to alternative views has diminished. Before the Internet, a rightwinger might read the Oz and their local Murdoch paper, watch Kerry Packer’s Channel 9, and listen to Alan Jones on the radio. Their social circle would often consist mostly of likeminded people, or would be one in which politics was avoided. It was (and remains) harder for a left-winger to get news only from leftwing sources, but someone who stuck to the ABC and the Fairfax press would have been exposed primarily to a socially liberal perspective. I’m pretty sure there is empirical evidence on this, but I haven’t got time to look for it now. According to several informed sources, Labor’s ‘pragmatism’ (perhaps better defined as spinelessness or capitulation) during the final hours of parliament managed to anger many of its own MP’s and alienate rank and file and supporters. What was even more astonishing is that Shorten and his faction did so due, handing Morrison a ‘victory’ -due to their worry that Christopher Pyne and others would run another scare campaign against them- a campaign of the very sort that only weeks earlier failed spectulary in Victoria. Which claims professionals in 2011-2012 were 50% more likely to be Greens voters, compared to average voting levels. I thought that 15% might have increased in the last 6-7 years, due to population increase in cities, older professionals retiring, greater increase in younger professionals to older professionals, higher vote of Greens with 18-40s, particularly with uni students and graduates, greater increase in female professionals (55%) to male professionals (45%), significantly higher female vote for Greens. To get to >40% of Greens are professionals, we need about 19-24% of professionals to be Greens voters. And too high a Greens primary vote works against my favour. 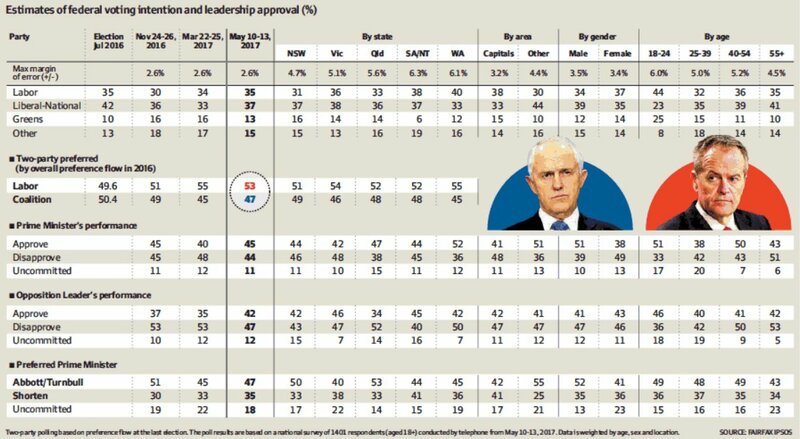 But good to see at the rate the Coalition is going, the Greens will hopefully soon be consistently out-polling them nationally in the 18-24 age group. Nick, the calculations in your most recent comment are all about Greens voters only. I appreciate that, J-D. 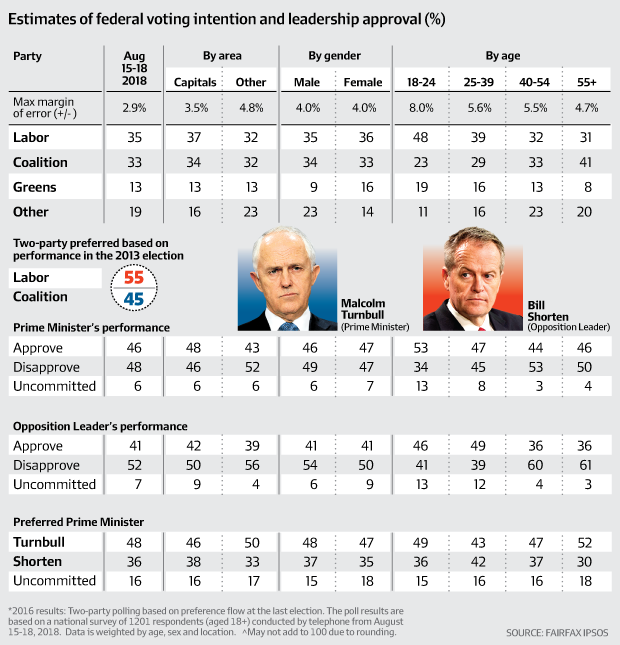 I never said ‘all ALP voters’ btw, as you suggested in your previous comment. That’s implausible. I settled for Greens voters, because they’re somewhat easier to identify than the ‘centre-left’. If I’d had some success one or way the other with Greens voters, I could then possibly have looked at breaking down ALP voters by geographical location, and social interchangeability with Greens on most if not every issue, to broadly identify a ‘centre-left of the ALP’. While I am interested in knowing the answer, that’s a lot more work than I have time for. A simple up to date poll of the electorate would be faster and likely to be more accurate. But I’m glad you challenged my guess. It was premature, and I learnt a fair bit while trying to find the answers. On reflection, I would update it to 35-40% for the Greens at least. At the end of your comment you asked a question. I will repaste the last paragrap for context. Q:) When will things change? Things change “on the day that prophecy fails”. The day (or year or decade) that the endless economic growth prophecies fail, and fail comprehensively and continuously, will be the time when people realise that have been sold a mess of falsehoods by the current system. How will they react? A:) They will die. But they will not die laughing. UNLESS they take an overdose of Saffron.